Aberfeldy & District Gaelic Choir was placed 4th out of 13 competing choirs in the Puirt a Beul Competition at the Royal National Mod in Falkirk, with the added accolade of being placed joint 3rd in marks for both Gaelic and Music. The choir was placed 7th out of 12 choirs competing for the highly coveted Lovat & Tullibardine Shield, singing their own-choice song Soraidh (arranged for us by Kenneth Thomson), and the prescribed piece Blar na h-Eaglaise Brice (arranged for the Falkirk Mod by Anna McDiarmid). The Lovat was won this year by Dingwall Gaelic Choir who were equal to Inverness in aggregate marks, but who pipped their rivals to the post by having one higher mark in Gaelic. Conductor Isobel Rutter said she was very pleased with Aberfeldy's performances, particularly in choir members’ efforts to improve their Gaelic. This year’s Mod is Isobel’s 2nd National Mod as Conductor of Aberfeldy & District Gaelic Choir, and despite weekly journeys from Glasgow to rehearsals in Aberfeldy, she already has her sights set on achieving even better results in next year’s National Mod in Oban – though she says it is more than that ambition which bonds her to the choir. “Being involved with a Gaelic choir, whether as a member or conductor, is not just about Mòds and winning – there is so much more to it than that as everyone in or around Gaelic choirs will know. I am thrilled and delighted to be a part of such a warm and close-knit group of people who are so very dedicated and hard-working. 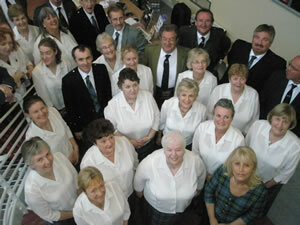 My thanks to all, especially May Brown and Seonag who work equally hard on the choir's behalf. Other successes from the ranks of Aberfeldy & District Gaelic Choir included Brian Owen, who was placed 3rd in the prescribed song for male soloists, and Linda Dewar, who achieved a 2nd and a 3rd prize in choral arrangement competitions.